Whether you live alone and hate coming home to a mountain of chores, or find yourself constantly overwhelmed by the seemingly never-ending to-do list that accompanies family life, chances are you’re spending more time than necessary completing everyday jobs. From easy tips that will help you get (and stay) organised to handy appliances from the brains behind Bosch (and recommended by electricals experts at AO.com) which are designed to speed up your daily routine, our guide will help you decrease the average time spent completing everyday jobs, so you can refocus your energies elsewhere. Sounds dreamy, right? If you can’t muster up the energy to cook dinner at the end of the day or use lack of time as an excuse to pick up (yet another) takeaway, you could benefit from meal prepping. By taking the time to prepare meals in bulk before the week begins – Sunday evenings are perfect – you’ll be well stocked for the week, meaning all you have to do is put your pre-prepared dinner in the oven or microwave and voila, dinner is served. Chilli (with meat, quorn or packed full of veggies), stews and soups are one-pot options that take little time (or energy) to prepare and can simply be frozen until they’re needed later in the week. Alternatively, prepping fresh veggies and storing them in water until they’re needed is a time-saving solution that will speed up time spent in the kitchen. We’ve all been guilty of letting unwashed dishes pile up, only to have to ‘leave them to soak,’ for a few more days, or put them through multiple dishwasher rounds when we finally muster up the courage to get our marigolds on. While completing a mass dish-wash once a week may seem like the more time-productive option, this is not the reality. Keeping on top of the dishes by stacking them in the dishwasher as soon as you’ve finished eating (or while food is cooking for equipment used while cooking) will take a matter of moments; save time in the long run and prevent the Sunday afternoon dish wash of doom. Sound overwhelming? Enter Bosch’s fantastic range of dishwashers. Complete with the aptly named ‘quick wash’ setting designed with those of us who are time-poor in mind, as well as ‘intensive cycles’ option which removes stubborn dirt (and relieves you of the need to put in any elbow grease) this is a dishwasher with time-efficiency at its core. What’s not to love? If you work full time, or have a busy schedule transporting children from a to b to c, you’ve probably experienced the frustration of missing a parcel delivery (on more than one occasion), only to discover that the depot is on the other side of the city. Chasing around after parcels isn’t what you want if you’re trying to reduce the time spent completing everyday jobs. Avoid this issue by purchasing electrical items from AO.com. In addition to offering next day delivery (convenient or what) timed delivery slots mean you can organise your day around deliveries, freeing up time to get on with other tasks and avoiding the dreaded ‘missed delivery’ note through the letterbox. While dishwashers are designed to make everyday life easier; reducing hours spent by time-poor families washing dishes, often the reality is not quite as straightforward. Everyday items – we’re looking at you, plastic lunch boxes – tend to have a habit of coming out of the dishwasher dripping wet (and splashing the rest of the dishwasher contents in the meantime) meaning they require time spent being hand dried. Relatable, or what? This is where the unique technology behind the Bosch PerfectDry Dishwasher comes in. Saving energy (and its users’ time) Zeolith technology – that’s the presence of natural minerals for us non-techies – work to ensure all (yes, all) contents of the dishwasher are dried to perfection. From plates to plastics, cutlery, crockery and everything in between, you’re guaranteed a dry finish, which will drastically cut back time spent unstacking and drying dishes. If you’re conscious of your impact on the Earth (and the amount of time taken completing everyday tasks), you may be seeking to minimise the number of clothes washes undertaken on a weekly basis. Investing in a laundry basket that encourages you to divide clothing into ‘lights’, ‘darks’ and ‘colours’ categories is an easy way to recognise when you’ve accumulated enough clothing to do a full wash – meaning you won’t undertake more washes than necessary – and relieves you of the faff of sorting through dirty laundry. If your under-the-sink-cupboard full of cleaning products is leaving you feeling overwhelmed, try organising cleaning materials into handy baskets with each intended for use in a particular room or area of the house. Storing each basket in the room it’s intended for will not only make cleaning easier (after all, everything you need is in one place) but will also encourage you to think about cleaning on a room-by-room basis, as opposed to being overwhelmed by the prospect of blitzing the whole house in one go. The following products make a great basis for cleaning baskets. Bathroom: clean microfibre cloths, toilet cleaner, multi-purpose bathroom cleaner, bleach and a mirror cleaner. Kitchen: anti-bacterial spray and clean microfibre cloths, hob cleaner and scourers, anti-limescale tablets and sink unblocker. Bedrooms and Living rooms: Polish and a duster, Zoflora and window cleaner. Offering next day delivery on a wide range of products and an unrivaled 5* rating on Trust Pilot from over 100,000 customers, make AO.com the go-to for all your electricals needs. 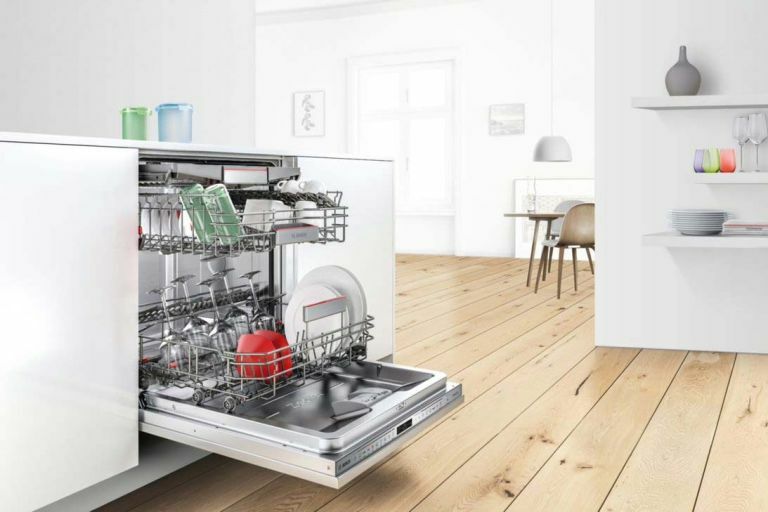 Keeping its customers' needs in mind, AO.com are proud to stock Bosch PerfectDry Dishwasher and can guarantee price matching, meaning you won’t be left out of pocket.